As Shawn Coyne always says, stories are about change. There has to be a change in every unit from the global story down to the micro beat. This applies to writing scenes as well. But what does all of that mean and how does it fit in to your story? The Five Commandments are the elements that build story. Without them, a story will have no life. These elements are what knock a character out of their routine, make situations worse, ask them to make a choice, and resolve that choice. If you don’t include these elements, your story won’t move. Whether you like it or not, these are the integral materials that combine to create every unit of story. These elements ignite and track the change. Change is usually obvious at that global story level. The story starts at one point and ends at another. A character experiences conflict and by the end, makes a change from one value to another. They learn a lesson. The events of the story have changed their way of thinking and, thus, their entire lives. But, to make every other unit work, there must be changes occurring there too. Starting with the global story, which breaks down to subplots, to acts, sequences, scenes, and finally beats. Every unit of story must include a change of some sort. 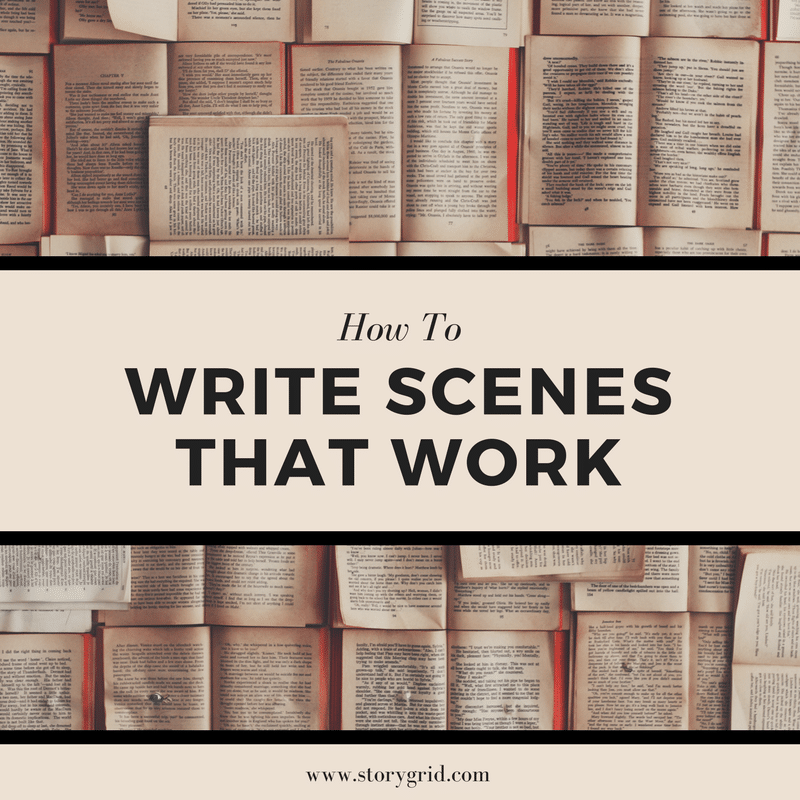 Rather than spinning your wheels unnecessarily, we’ll focus on writing scenes because it is the building block of a story. Keep in mind, however, that all the commandments must be included at each level. Per Shawn’s Pride and Prejudice Story Grid edition, a story event is an active change of life value for one or more characters as a result of conflict and a working scene contains at least one story event. Once again: stories are about change. More specifically, stories are about change motivated through conflict, and the change is designated by a shift of a story value. According to Robert McKee, story values are the universal qualities of human experience that may shift from positive to negative, or negative to positive, from one moment to the next. For example: alive/dead, love/hate, wisdom/stupidity are all story values that may change from one to the other and back again. These values must shift from the start of each scene to its end in order for a change to have occurred. For example, in Harry Potter, when Harry gets to go to the zoo with his cousin the scene shifts from left out to included as well as from normal to weird. There are many ways to interpret a scene, so don’t get worked up about finding all the changes. Whichever you choose here, it’s obvious that something has happened. Harry is not the same boy living under the stairs. And those changes promise to be paid off in a larger way later on. So, every scene must contain a shift of a value on one position on a value’s spectrum to another. If there is no shift in value, the words you’ve written do not equate to a scene. They are exposition or description or scene setting or just plain rambling. But how do The Five Commandments create change? Each of The Five Commandments serve as components to create the change… they are akin to the mixing of elements and energy to create molecules. When writing scenes that work, you must have all five commandments. Two atoms of hydrogen plus one atom of oxygen results in one molecule of water. Similarly an inciting incident plus progressive complications turn into a crisis which leads to a climax and the net effect is a resolution. The Inciting Incident kicks off each scene. At its most basic concept, an inciting incident must upset the life balance of a lead protagonist(s). Whether it’s for good or ill, the inciting incident makes your protagonist feel uncomfortably out of sync. It asks them to look at reality in a new way, to readjust to new information, or to settle in to uncomfortable circumstances. There are two ways to frame an inciting incident: Causal or Coincidental. In either case, the inciting incident gets the story or scene going and makes a promise to the reader of what’s to come. Causal inciting incidents are the result of active choices a character makes. A wife leaves her husband, a boy chooses to trust a girl, a character faces their antagonist head on. Coincidental inciting incidents occur when something happens by chance, or randomly. A train arrives a half hour late, a boy comes home to the parent he didn’t want to meet first, a woman grabs the wrong suitcase at the airport. To excite a reader, write inciting incidents that hook them and make big promises. Just remember to pay them off…that is resolve them clearly in a way that has changed the character by the end of the scene or if it’s a huge inciting incident (the one that will begin the entire story) by the end of the story. Also, fulfill the expectation in an unexpected way. When the reader expects one thing, give them something else so that they don’t see what’s coming. Mix up causal and coincidental inciting incidents throughout a story. So long as every scene contains an inciting incident, something meaningful has potential to happen. And when that potential is in every scene…the reader will keep reading. Progressive Complications are the escalating degrees of conflict that the protagonist faces. To test whether or not each complication builds in intensity (and this should be the case for both successes and difficulties), assign each complication a number from 1 to 10 and track the numbers. And yes your subjective interpretation is valuable. If your complications never make it higher than a 5, you know things aren’t really going anywhere. Turning Points are the peak progressive complications of a unit of story. These are the highest complications in the scene when the character is presented with fresh information that pushes them to a crisis (revelatory turning points) or someone or something actively forces the character into a crisis. The character is forced to react. Turning points drive the complications to a point of no return. They can be active or passive. Active turning points are turned on character action while passive turning points turn on revelation. Without escalating degrees of conflict reaching a point where the character has to react, a scene will be boring. It will feel like nothing is happening. And, without tension, no change will occur. To surprise readers, vary the types of turning points you use in your work and make sure the complications build to a point of no return, or when the protagonist can no longer return to the way things used to be. This will resonate with your readers because it forces your characters to make a choice and that will drive meaningful change. The definable dilemmas that a character faces must coalesce into a question that offers a choice between two options, or a Crisis. A crisis asks a character to make a decision (and, yes, choosing not to act is still a choice). Making a decision is the only way to show who a character is. Who we really are as human beings is revealed by what WE DO not what WE SAY. How boring would it be to follow the life of a character who spent every day doing the things we do? Wake up, get ready, go to work, come home, get ready for the next day. Yes, it’s essential we follow our routines or we risk losing our jobs/livelihood which could lead to even greater complications later on. But, having a character who doesn’t make any drastic choices will leave the reader feeling like they don’t know the character no matter how well described their features are. Character is action. We make a choice and we execute a choice that results in change. Action leads to plot. Plot is the sequential events of a story. The events are created by inciting incident, complications, crisis, climax, and resolution. It’s all connected. There are two ways to force your character’s choice: Best Bad Choices or Irreconcilable Goods. Basically, they boil down to how the situations fare for the character and those around them. Are both choices seemingly terrible or do they both seem good but for different characters? Chances are the first is a best bad choice and the second is irreconcilable goods. Either way, a decision has to be made. Will a starving vegetarian eat fish or meat if those are the only two foods available? Will I take the last piece of pizza or let someone else have it? And the answer to these decisions is the active choice of the character, the Climax. Climax is the truth of the character. Do they say one thing only to turn around and do another at the last possible second? Do they put in the work they say they will? The choices a character makes usually build throughout a story, but at a scene level must still occur. Choices define who the character is and, in order for change to occur (whether internally or externally), active choices must be made. A Resolution is the necessary followup to everything that has happened before it. It doesn’t have to be long, but in order to feel like a story was completed, a resolution must be included and compelling. Resolutions shouldn’t be summations of the prior events, but don’t exclude a resolution altogether. They should instead let the reader know what the climax of the story means and how the worldview has shifted because of it. I don’t know about you, but I believe the only way to bring about meaningful change in the world is to first be shown how to change through story. Stories show us how to love, what decisions we should/could have made, and let us try out various situations from the comfort of our own homes. They teach us what to do and what not to do. And, they are important on a level way beyond that of pure entertainment, though we can pretend that’s the only case. Writing scenes that work means hitting all five commandments of story telling. You’ll need inciting incidents that knock a protagonist out of their normal. Progressive complications that build tension until they are given a choice and forced to make a decision. A choice that defines who they are and must be answered. And an answer that will lead to a resolution and a new way of looking at the world. Without any of these elements, a piece of writing is not a scene. Scenes have to move and change has to occur because meaningful change is the whole purpose of a story. Rebecca Monterusso is a Story Grid Certified Developmental Editor, which is a fancy way to say that she helps writers learn to tell their stories better by focusing on writing, reading, and living with intention. She spends her time traveling the world, writing whatever takes her fancy, and deconstructing the many stories she reads on her blog to better understand the craft of writing. Ultimately, she believes that stories are the only way to change the world, which makes writers mighty powerful people. I really hate it when someone describes almost exactly what I am attempting to do. Who taught me this? Where did I learn it? But here it is and I rejoice in seeing it from someone else. Lee, I’m glad to help! Let me know if you have any questions. Excellent. How do the steps of the Five Commandment relate specifically to change in value? Thanks. Wayne, the 5 commandments are what enable the character to reach a change. They are what the character has to go through in order to have something meaningful happen in a scene, and the value change is the result from the commandments having happened. Does that make sense? Fantastic explanations of the Five Commandments! I especially loved this, “Who we really are as human beings is revealed by what WE DO not what WE SAY.” Bravo! Thank you Talmage! I love how stories are so applicable to our lives. I am finding it hard as I try to figure out how deep to go if I am writing at a very young readers level. I guess it would be considered a beginners novel for young children. I am assuming that the five commandments still apply, but when is it too much. The same with the obligatory scene. The Story Grid has helped me realize what I was missing in each part of my manuscript but as I begin to start my second draft I feel that I may be going to deep for young children. Do you have any suggestions? Samousseau, I have this problem myself! When is studying too much? When should you get back to the work and stop worrying so much about including everything? My advice is to shut your editor brain off when you’re writing. Pack as much of the information in your head as you can before writing, but then let your writing brain flow so you aren’t over-working it. Also, as I always recommend, go back to stories in your genre that you know work and study them. The best part about being a writer is that you are not alone in this effort. So many have come before you and have succeeded. If you feel like you’re being to analytical with your approach, look at other short stories and children’s books that are the top of their genre (they have sold well for a long time or their story resonates with you for whatever reason) and study what works about them. I find that Shawn’s method that he talked about on the podcast of thinking of scenes that work because they stick with you (he used this example for Charlotte’s Web) is a different approach that may get you out of the weeds a bit. Thank you so much for taking time to respond. I think you are right I am over thinking and need to just write. I will set my mind to that right away! Maybe I need to read Charlottes Web again! Love this quote: “I believe the only way to bring about meaningful change in the world is to first be shown how to change through story.” Absolutely. Thanks for this post. Also, I love your bio! I can relate. Thank you, Jennifer, for your encouragement! It’s so hard sometimes to know what you really want and if you can succeed at it, so having others who tell you they can relate and appreciate your work is very rewarding. Thank you for this article. For me, it’s like the Fool’s Cap Method for the Fool’s Cap Method. In one succinct post, you’ve captured his key elements of how to get readers to turn pages. And I’m so grateful for the clear, logical way you presented the information. Now, I have a question. Most of my work is for picture books and rarely go beyond a thousand words. It seems that all your ideas will apply, but is there anything more you might recommend for what is essentially writing a short, short story? Misterzee188, thank you for letting me know this helped you, it’s what makes writing and studying stories worth it. I also write super short stories and know how hard it can be when the things you like to read don’t alway fit in with the analytics of stories you know in your head work. Picture books are difficult because the form so often changes in order to engage young readers. During my time working at a bookstore, I loved reading them just for fun and a few stuck with me. I’m thinking of Don’t Push this Button, Stuck, and I Want my Hat Back as more modern examples. Some still follow the general arch plot while others play with style, but don’t necessarily include all the elements we know to expect. My advice is to take a look at the stories that you want to emulate. Study them for their content and why they work for you (but also for the kids who read them). Knowing The Story Grid principles will help you put a language to what they are doing and how. Once you have a better idea of what’s working in successful books, go back to your own and try again. It’s not that The Story Grid isn’t applicable to shorter stories, it’s that Shawn, like all of us, chooses which genres he enjoys and writes about them (thriller, in this case). We can’t be afraid of doing the work ourselves for the genres we love and want to write in too. Let me know if that helps. I’m interested in seeing what you come up with. Martin, thank you for your kind words. Let me see if this helps to clear things up. Inciting incidents are what set up the obligatory climaxes. The resolution is what explains what the climax actually meant to the life of the character. So, basically, the inciting incident is making a promise. Many times this is a convention of the specific genre. For example, in a murder mystery story the inciting incident is the discovery of a body. That promise is paid off by the climax of the novel. In our mystery story example this would be the point when we find out who actually committed the crime. And the resolution is an explanation of what that all means to the character(s). The resolution is oftentimes a short and sweet add on. In some movies it’s the photo montage of what the characters are doing with their lives now that the events of the story are over. I picture Monsters University when we discover how Mike and Sully made their way from the ground floor of Monsters Inc. all the way up to the scare floor where we first see them in the original Monsters Inc. Does that help to clear things up? If you still have questions, let me know. This is an article I’ll go back and refer to in the future to remind myself of WHY each of the 5 Commandments is so important in reaching crucial scene turning points. I particularly like the fact that you mixed a Harry Potter reference and a chemistry reference here, both are basically magic, as far as I’m concerned. Terrific and very useful article. Thank you Shelley, I’m so glad to be able to help you when writing your own work. I think I’ll be using my own words again and again to help me too. Not to toot my own horn, I think it’s just that Shawn’s advice (even reworked and rewritten from my own head) is just so applicable and useful that I have to remind myself of it every day. Reina, that’s a good question. Irreconcilable goods are two things that are good for different people. So, what’s good for one character might not be for the other. An example Shawn uses is from Kramer vs Kramer where Dustin Hoffman’s character has to choose whether or not to stay home and care for his child or get a nanny so he can stay on track with his career. Staying at home with his child will be good for the child because he will get to see that love is more important than money and that his father ultimately cares for him a great deal. Getting a nanny would be good for Hoffman because he will get to continue making money to support his child, but also be able to advance in his career and show his child what it takes to be successful. Both options have good elements to them, but the good is heavily sided toward one character depending on the choice. The best bad choices can be external or internal. Does your character get out of the house and socialize, which wouldn’t be the most fun for any introvert, or do they stay at home again and watch tv? Staying at home would mean giving up the opportunity to meet new people which can be good or bad. Another example from Kramer vs. Kramer is when the wife decides to leave her husband. Staying would deny her inner self, but leaving would tear apart her family (and her four year old boy would have divorced parents). Both choices are difficult and seem impossible to make. Basically, I think if you’re getting too caught up in whether something is best bad choice or irreconcilable goods, you’re spinning your wheels unnecessarily. As long as your character has a choice to make and therefore does something (or chooses not to act), you’ve got a great start. I can’t say for sure, not having seen your scenes, but there has to be a choice of some kind in order to show what the character is actually made of. If I can make a meta-comment: Shawn Coyne’s writing is brilliantly simple, but the ideas are so rich that it takes multiple engagements to really understand them. That’s why it’s so helpful to have someone re-phrase them, as you’ve been doing in these blogs! Brandon, thank you for your support! I don’t personally know anyone using these principles to teach younger audiences. Luckily, I have a whole host of other editors who are here to help. Shelly just posted this blog: https://www.altedaustin.com/blog/youre-never-too-young-for-your-first-draft which might be a great place to start. I’m waiting to hear back from some other people as well and I’ll get back to you if something else comes up. One thing I did do was share the book with two of my previous high school teachers just to get the ideas out there in my own neighborhood. If I hear back from them, I’ll also reach back out to you and see what they say. I love that you’re working on sharing these principles to younger audiences. It’s never too early to learn and I wish I’d known all of this at a younger age. Brandon, after some help from my lovely editors, I’m able to tell you that Steve Peha on the Story Grid Workshop Facebook group is an incredible resource. He’s been working on doing exactly this and, from my personal experience, is super helpful in getting you the resources you’d need to teach younger audiences the SG principles. I highly recommend joining the FB group if you aren’t already a part of it and to connect with Steve Peha who is already expecting your outreach. Best of luck and let me know if I can help any more. Great article. The turning point has been a mystery for me. Sometimes it appears the turning point is the peak of the progressive complication, as you suggested. Yet sometimes it’s a sudden unexpected turn in the scene (such as a bomb going off in a restaurant). And what is the relationship between the turning point and the all is lost moment? It seems sometimes the turning point is the same as the all is lost moment… and sometimes the all is lost moment seems to happen a little later. I’d love to read some examples of the different types of turning points to get my head around it. Tony, I share your confusion. Right now I’m analyzing The Knife of Never Letting Go by Patrick Ness and there are tons of beats that include turning points riddled in each chapter. I have a hard time focusing on what one to choose, given that they all seem to change the direction of the scene or are the height of the progressive complication. In fact, I’d highly recommend that book as a great example of turning points if you’re looking for some to study. Another example would be to read the Story Grid Guide to Pride and Prejudice because those will be clearly labeled throughout the text for you. Shawn uses the bomb going off example in The Story Grid in chapter 42. It’s from Zero Dark Thirty and the scene starts by setting the audience’s expectations up for a meal between two women. The turning point is when the bomb goes off and changes the scene completely. What’s interesting to note is that, if the scene were just going to be a meal scene, the bomb is the moment when the progressive complications are at their peak. One character has shown up late, which heightens the tension to a palpable level. Technically, that turning point could have been anything, but the active bomb going off changed the direction at the same time as being the crest of the progressive complications. The fact that it’s different from the expectations is what makes it an unexpected turn. As for the All is Lost Moment and the turning point. Remember that turning points are in every level of the story. There are turning points in every beat, scene, sequence, act, subplot, and global story and some of them overlap. The all is lost moment is what forces the character to make a choice that will push them into the ending payoff and is, as a part of the global story, its own turning point. Think of it as if it were the depression stage of the Kubler-Ross curve or the Ordeal within the Hero’s Journey framework. Basically, the global story has its own set of the 5-commandments and the all is lost moment is the same thing as the turning point for the overall story, though there are many other turning points at every level. I hope that helps, but feel free to let me know if you need more explanation. This was a tough one for me for a long time too. Here’s what I’ve figured out that helps… start with the question “What is the value at stake in this scene?” So taking the full scene into account, what is the main value at stake? Then, the turning point of the scene is when THAT value turns. So little turns inside of beats are harder to ignore because they aren’t when the overarching value of the scene shifts. Question – is there an ‘All is Lost’ moment in each scene as well as the global story? And is that scene ‘All is Lost’ moment essentially the turning point (the peak of the progressive complication)? Tony, the all is lost moment for the global story is the big point of no return for the protagonist. While there may be smaller all is lost moments throughout scenes or sequences, they aren’t necessary in the same way the main all is lost moment is. I know that sounds slightly confusing, but basically, your turning points can be mini all is lost moments for the character because they require a choice of some sort to be made and a change in the character, but they don’t have to be. What’s different about scenes and other smaller levels of storytelling (compared to the global story), is that they don’t have to be all is lost moments and can instead just require the character to act. For example, the scene in Harry Potter when Harry gets the letters and Uncle Vernon shifts from fear to panic (as described in Tim’s story grid here: https://docs.google.com/spreadsheets/d/1zjpU5OvVOiK4tR3aEwCMG5wz2_wlaRwBFL5jePWmirs/htmlview), the turning point is Uncle Vernon’s all is lost moment when he packs up the family and decides to leave the house. Compare that to when Hagrid shows up at the abandoned island house. Hagrid describes Harry’s weird heritage to him and is met with protests by the Dursley’s. The turning point there is when Hagrid casts the spell on Dudley which moves Harry from fear to excitement. That’s not an all is lost moment, but rather a different turn of the scene. As Tim described in his above comment, the turning point shifts the main value of the scene and change from positive to negative or vice versa. The turning point, whether it is an all is lost moment or not, is the peak of the progressive complications which then leads to the crisis question. The character must now act and can no longer ignore what has been going on. Excellent article. Thanks for sharing this with us. Thank you Rachelle! I really appreciate it. I have a question way off the mark here. I have taken Sean’s suggestion to go back to books and authors that I really love and want to emulate in my own works. I try and emulate the pacing and tone but I am always afraid of crossing the line into copy write infringement or plagiarism even though the story and words may be different. Any thoughts? Beth, I do not think your question is way off the mark, as you say, at all. It’s actually a very good point and one I’ve asked myself many times. What I’ll refer you to is the podcast episode when Tim asks this very same question: https://storygrid.simplecast.fm/0eab34f9. I will also point you to Elizabeth Gilbert’s advice on ideas: https://www.irishtimes.com/life-and-style/people/elizabeth-gilbert-when-a-magical-idea-comes-knocking-you-have-three-options-1.2474157 because I really think she’s on to something. Lastly, let me point out an amazing (and short) book that really sums up this idea very nicely: https://austinkleon.com/steal/. To summarize all those sources, I’ll say that I think that we are all capable of writing books that only we can write. If you want to emulate someone’s work you love, that’s awesome. In fact, getting yourself to write is really easy when you try to first copy the voices of those that you love and then use that work to master your own writer’s voice. Ideas are tricky things that are hard to nail down and they don’t come from nothing. Everything out there has already been created, you just have to find your own unique spin on all the ideas and things you love in order to create a piece that’s uniquely yours. And, the fact that you’re worried about plagiarism is a good sign. Of course you don’t want to take something that isn’t yours and play it off as if it were, but look at Harry Potter for example. Many people criticized the giant spider and wise old wizard for being similar to The Lord of the Rings. Does that mean it’s plagiarism? I don’t think so. I think that there are certain elements that you can use, but that putting your own mark on them and combining other ideas with them, are what help to put that fresh spin on your work. Being able to starkly see elements of the pieces you love in your work is ok, so long as you’re not blatantly copying. Even better is to mix so many elements from the things you love that people can no longer tell exactly where it all came from and think it’s completely new itself (though we both know the truth). Sometimes, copying the pacing and tone are the extra help you need to get a first draft down (or even a second or third), but I think you’ll find that the elements of your story will take on their own life the more you work with them and listen to your intuition. Do what you can to keep yourself writing and keep asking the right questions. Let me know if I can be more clear on anything. Nice to see some more content that provides explanations from a slightly different perspective. Tied the five elements and their supporting devices up neatly here. Thank you, and I’m glad you enjoyed the post! Thanks for this great article! I have a question about a scene. Say there is an inciting incident and progressive complications and crisis that cause the character to question how she sees the world, or what she believes. She considers this but decides, no, she will stick with her convictions. It seems there isn’t really a value shift. She’s right back where she started at the beginning of the scene. She will change in later scenes, but for now, she’s purposefully not changing. Can there be an exception to the polarity shift in a scene? Thanks!